Trying to Count the Cornish Wildflowers | Notes from the U.K.
Wild Thing and I hadn’t really seen the Cornish countryside until we discovered the footpaths, and the wildflowers bowled me over. I was living in Minnesota then, and when it isn’t frozen solid and buried under snow Minnesota is green and beautiful and all that, but you wouldn’t be tempted to call it lush. It’s too cold for too much of the year. What wildflowers grow there always struck me as self-effacing, somehow, as if they didn’t want call attention to themselves. A lot the people are like that too. T. and S., whose roots are in western Minnesota, swear there were more wildflowers when the farmers didn’t use pesticides as enthusiastically as they do these days, and I’m sure that’s true, but still, Minnesota’s a bit like the Puritans were: It’s never going to encourage a wild profusion of stuff it doesn’t absolutely need. Montbretia, pronounced mombresia. Or something like that. Considered not just a weed but a thug. Isn’t it gorgeous? So, while I was on parole from Minnesota, I’d walk along the footpaths in Cornwall and try to count how many kinds of wildflowers were in bloom. To understand what a misguided undertaking this was, you have to know that numbers and I are not on good terms. Ask me to remember the number 3 for more than a minute and I’ll need to check my notes. Ask me to solve a word problem (Train A left station B at 3:44….) and I’ll weep. Or at least I’ll want to. So voluntarily counting anything indicates an extreme state of mind. In this case, it was extreme happiness. So much color. So much life pushing up out of the ground. I’m tempted to say so much unnecessary beauty, but yeah, the ecosystem, the necessity of so many things we humans don’t think are necessary because we can’t make any immediate use of them. All of that. Still, you can see what I’m getting at. The problem with counting wildflowers was that first, if I’m distracted at all, I can’t reliably count from 1 to 70 without losing my way. Did I say 70? Make that 10. But second, and more to the point, I couldn’t keep track of which flowers I’d already counted. If you don’t have names for things, it turns out, it’s hard to remember them. Little yellow flower, bigger yellow flower, little yellow flower that isn’t like the first yellow flower because it has four petals, although maybe the first one did too because I wasn’t noticing petals, only color and size at that point. Little yellow flower that also has four petals but they’re pointy. Little yellow flower that I might have counted already but I don’t think so. I often wonder how animals remember in the absence of words. Of course, as far as I know they’re not counting, but they do other complex things, like remembering smells and places and long routes. It’s not all looking at a plant and thinking either yumm or bleah, that tastes foul. Anyway, I bought the first of my wildflower books and began attaching names to what I was seeing. And the odd thing is that this allowed me to see them better—to notice and then remember petal shapes, leaf shapes, the ways leaves grew on the stem, and from there stem shapes and whether the leaf or stem was hairy or smooth. I’m still useless with some of it. Talk of sepals sends me into a panic. Heights given in centimeters might as well be written in an alphabet whose origins aren’t on this planet for all the good they do me. That first book led to the next book, which was organized differently and promised more, better, deeper. And another book after that. One that had photographs. Another that had drawings. Each one had advantages and drawbacks. Then one organized by color, which I’d always thought would be simpler but still leaves me flipping through page after page, looking for a match for something new that I’ve brought home. Or something that isn’t new—I know I’ve seen it before—but I’ve forgotten its name since last year at this time. Although I do love being able to identify the ivy-leaved toadflax. No matter how many I learn, though (and I haven’t learned that many), there are always more. If this sounds geeky, that’s because it is geeky, but it’s not about checking off how many flowers I’ve seen or how many names I can recite. By learning the flowers, I’ve learned a new way to watch the seasons roll past. The first wild primroses come into bloom when it’s still winter, and they tell me spring’s coming. Then the celandine comes out. It’s a low-growing yellow flower. Spring progresses with each new flower, and I think of it as a yellow season. This entry was posted in Other Stuff and tagged Americans in Britain, Americans in England, anglophile, Britain, Cornish countryside, Cornwall, England, footpaths, wildflowers by Ellen Hawley. Bookmark the permalink. I googled your montbretia… I believe I have seen it offered here as an annual… I envy your growing season. The borders of the road in your photo are gorgeous. One gardener’s “thug” is another gardener’s envy, I suppose. I can’t say I’ve really seen much of the Cornish wildflowers, but I was still impressed by the mediterranean-like vegetation and the Cornish gardens. It’s an odd climate–warm enough, just barely, to grow palm-like stuff, but not at all a warm climate. As a gardener, I’m finding it hard to adapt to. Hm, I had thought the climate would make for easy gardening with lush vegetation. Well, yes and no. Tomatoes don’t do well–they want warm nights, and most serious gardeners here grow them in greenhouses. I tried some bell peppers this year and they’ve only just gotten around to blooming. And so forth. We don’t get the extreme cold that Minnesota did, but we don’t get truly warm summers either. Plus the slugs and snails are voracious. It does take some getting used to. Well, a different climate here, but basically similar problems. Usually when I read one of your posts I think, “Dang, I have to see that place” – even if I think it only because of the irrelevant picture. Now I know I have to be there. It really is insanely beautiful. Let me know if you ever get over this way. I love looking at wildflowers, and weeds, because they are right there, along the roadside. I wait every year for chicory, and burdock, and wild mustard, and queen Annes lace, …. I have been told, by English friends, that the English gardening magazines take photos on the one and only sunny hour of the season. The rest of the time it is rainy and miserable. Is this true? 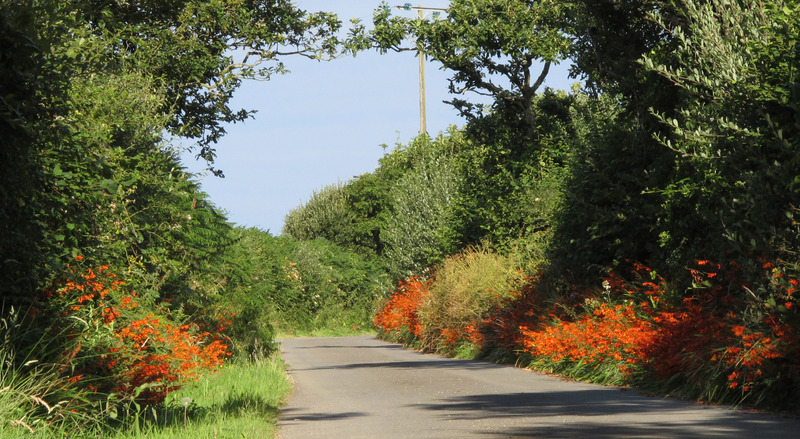 Pingback: British wildflowers and British roadsides | Notes from the U.K.